VANESSA and I—we go a long way. We were seatmates and partners in crime back in high school—first row, near the trellis. We would later be partners in our science research project, which was hogwash in the greater scheme of things. I hope it's buried somewhere so no one else would find it. I was a frequent visitor to her home in Tambis Street, where we would work on school stuff, the actual work comprising 5% of our stay there. The rest was spent chatting or eating her sister's homemade brazo de mercedes. She celebrates her birthday today. I almost forgot about it, as I am bad with birthdays—that she knows. We hardly see each other now. The tragedy of separation. This was Vanessa two years ago, when she was struggling with law school. 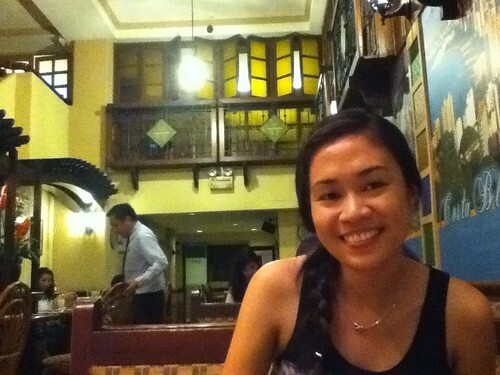 We ate at a restaurant in Timog. And this was her, just a few weeks after she had landed a job in a prestigious law firm last year. So happy birthday, dear Vanessa! I count it a great joy to have known you for 15 (give or take) years now. OMG nag-abala! I'm so touched! Thank you lansoy! This is so sweet! Can we please meet next week? Malakat di si Willie and we all miss you! Of course. I'll get in touch. Makati area would be great. May ara, as in?! Pwede man gani mag-anonymous comment.